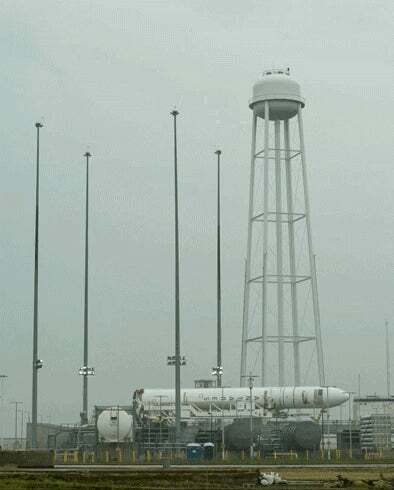 NASA exuberantly celebrated the erection of an Antares rocket today in preparation of the upcoming Orb-2 launch. Now my inner 13-year-old can't stop snickering. Aside from being exceedingly happy to see you, Orb-2 is a pretty standard Commercial Resupply Services mission to the International Space Station. Now the Antares is properly erected and firmly vertical, the two stage rocket will launch on Saturday, July 12 at 1:14 p.m. EDT, boosting Cygnus into orbit. After separation, Cygnus will spread its solar arrays, and mosey on over to the space station by July 15th. Once it's close enough, the Canadarm will grapple it in close, berthing Cygnus at the Harmony node. Cygnus will hang around the station for approximately 30 days as it is unloaded, then refilled with junk. Finally, it will kick off from the station, and gloriously burn up during reentry.